Iolo System Mechanic is a quick, simple way to clear unwanted files from your PC and give it a noticeable performance boost. You’ll be asked to submit an email address during registration, but this will just be used to send you a free activation code; Iolo won’t share it with third parties. First, you’ll be prompted to perform an initial system scan to analyze your PC for potential issues, such as broken registry entries and junk files. There are two simple options: Quick and Deep. The latter takes a little longer, but finds more deeply hidden issues. Once the scan is complete, you can select ‘Repair all’ to correct all the identified issues with a single click. This is a great option if you’re looking for a quick solution to PC performance issues and don’t want to delve into the nitty gritty of system maintenance, but if you’re looking for more granularity, the results page provides an optional PC Cleanup Wizard that lets you drill down and decide exactly which files to remove. This first scan and subsequent purging of unnecessary files might take a long time, so the option to shut down your PC once it's finished is a nice touch. Some system maintenance and optimization tools leave you in the dark about what they’re actually doing to your files, but not Iolo System Mechanic. Every option is explained in plain English so you know precisely what each control does, and the further you drill, the more detail is provided. It isn't perfect; once it's finished sweeping up the cruft the accumulates on an untended PC, Iolo System Mechanic suggests various real-time optimizations of your hardware. These are only available in the premium edition of the software, but there's no way to tell this until you click one and are prompted to upgrade. This is a minor quibble though; although we'd prefer to see these limitations made more obvious Iolo System Mechanic is a great PC maintenance tool that's particularly well suited to anyone who wants to give their system a performance boost but finds more complex tools intimidating and worries they might accidentally remove something they shouldn't. It's very hard to go wrong with Iolo System Mechanic, and its cleanup options can make a tangible difference. 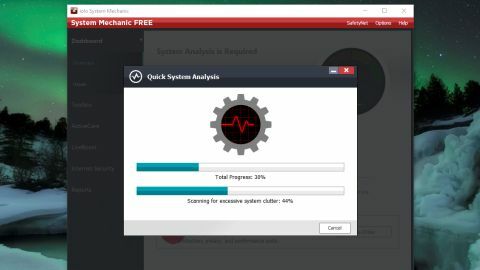 For more comprehensive PC optimization, you can upgrade to the premium version of Iolo System Mechanic or Iolo System Mechanic Pro and get 70% off with the voucher code TECHRADAR. The premium edition of Iolo System Mechanic offers a tool called ActiveCare that removes junk files and resolves system problems whenever your PC is idle; LiveBoost, which optimizes PC performance; and improved cleanup tools to eliminate more types of system clutter. It also includes Privacy Shield, which makes it easy to switch off Windows data collection tools that are otherwise tricky to deactivate. Iolo System Mechanic Pro offers all the same features, plus advanced protection from malware, including behavioral analysis to eliminate even zero-day threats.